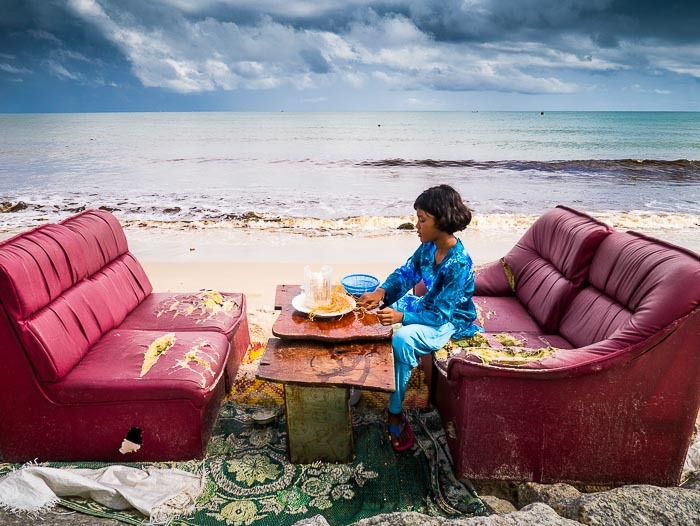 A girl sets out a meal for her family on the beach in Kao Seng, a village in Songkhla province. One of the things I like photographing is the little incongruities of life. Dictionary.com defines “Incongruous” as “out of keeping or place; inappropriate.” That’s certainly what I thought when I saw this living room set on a beach in Kao Seng, a little north of Hat Yai in Songkhla province. I was there photographing fishermen and walked past the furniture. I made a mental note of it but photographically it didn’t work without a human element. I went down the beach and photographed the fisherfolk for a couple of hours. I was walking back to my car and the young lady was setting the table. This was the picture I was waiting for, the moment it clicked. Everything came together for a few seconds – the blue sky, the aquamarine ocean, the girl’s blue clothing all contrasted with the red furniture set and the girl’s warm complexion. Everything fell into place to create the photo I saw in my mind when I originally walked past the furniture. 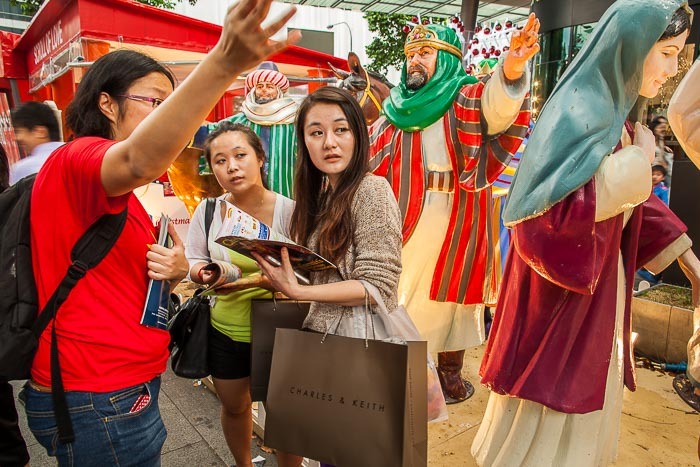 Shoppers ask for directions on Orchard Road in Singapore. A few months later I was on Orchard Road in Singapore. It was the Christmas season and seasonal decorations lined the busy thoroughfare. I was trying to photograph people walking between and around the statues of Mary and Joseph, Wise Men and donkeys. The photos were more like snapshots and not really working. Then lost shoppers and a Good Samaritan wandered into the frame. It was the moment that clicked, when everything fell into place. Finally, on a road trip in northern Laos, I stumbled upon this scene. 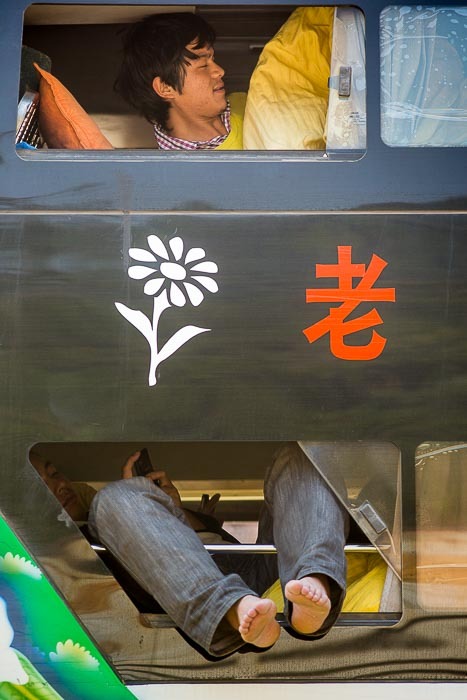 Migrant workers from China in a bus in northern Laos. This photo was a gift. There was no waiting for something to fall into place. I was headed up to the Lao-Chinese border. I saw this scene as we passed a bus full of Chinese migrant workers. I practically screamed at the driver to pull over and was out of the car before it came to a complete stop. I ran back down the highway to the bus and nothing had changed – the person on the lower bunk was still dangling his legs out the window while the person in the upper bunk was still framed by the window. I made a couple of frames before the person in the upper bunk moved out of the frame. This was the easiest of these three photos, there was no waiting, no hoping for something to happen. As a photojournalist I can’t set up a photo. I rely on luck and timing to complete my photos. That doesn’t mean being purely reactive though. Only in the bottom photo was I completely reactive. In the photos from Kao Seng and Orchard Road I saw the pictures before they actually took place. I knew what I wanted and I essentially waited for things to fall into place.